After a brainstorming session with A.J. 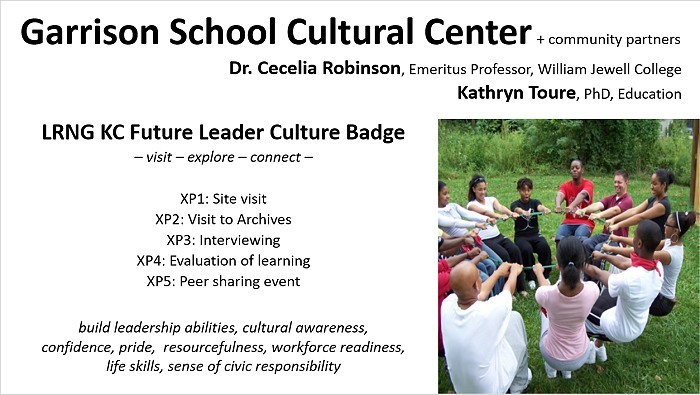 Byrd (Garrison School Cultural Center President) and Dr. Robinson, Dr. Toure wrote a proposal for a Future Leader Culture Badge that high school students in the northland can complete and place on their social media page, or on their resumes. There were three cash awards for the best proposal: $500, $750, $1,000 and three honorable mention cash awards for $250.00. The Kansas City Public Library won the grand prize of $1,000.